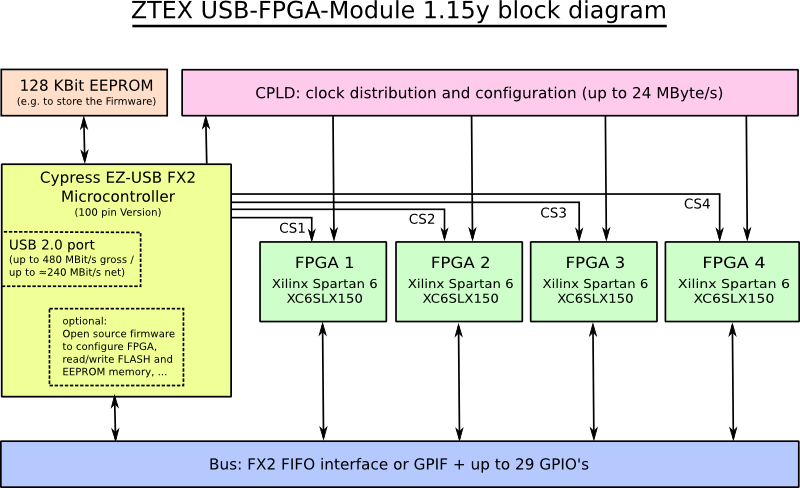 In order to simplify the porting of applications from USB-FPGA Modules 1.15d and 1.15x to USB-FPGA Modules 1.15y the FPGA Boards are designed to be as compatible as possible. In order to ensure signal quality all clock signals are distributed using the CPLD. Unused I/O's that are connected to FX2 outputs must float. This also includes I2C signals. It is recommended to let all unused I/O's float. For more complex applications the following methods, macros and variables are available. The Macro PRE_FPGA_SELECT is called between deselection and selection of a FPGA. Typically it is used to sore / restore IO states. The following example saves IOC state for previously selected FPGA and restores the IOC state for the newly selected FPGA. void selectFpga(int num): Selects a FPGA. This calls the select_fpga method of the firmware. Simple examples can be found is the SDK package. A more complex application (which uses the PRE_FPGA_SELECT macro is BTCMiner.